Dissemination of the Leaflets | Weiße Rose Stiftung e.V. Ziel der Weiße Rose Stiftung e.V. ist es, im In- und Ausland die Erinnerung an den Widerstand der Weißen Rose wach zu halten sowie Toleranz und demokratisches Bewusstsein zu stärken. The White Rose group aims to find enemies of the regime in other cities and get them to help with the dissemination of the leaflets. 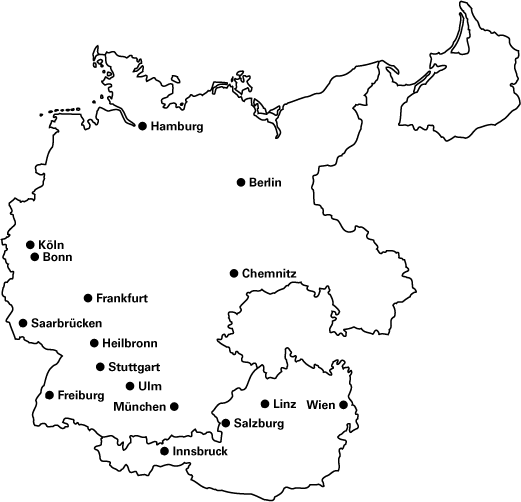 They recruit trustworthy friends and acquaintances in Ulm, Stuttgart, Saarbrücken, Bonn, Freiburg, Hamburg, and Chemnitz. Hans Hirzel and Franz J. Müller are in their senior year of high school in Ulm. When Hans Hirzel hears about the Scholl siblings and their critical attitude towards the regime, he sets up a first meeting with Hans Scholl in the winter of 1941/42. The following summer, he receives a leaflet in the mail. Hirzel suspects Hans Scholl is the author, goes to Munich and meets the circle of friends on the eve of their departure to the Eastern front, 22 July 1942. Sophie Scholl later gives him money for him to buy a duplication apparatus, which he does buy, but eventually throws into the Danube for fear of being caught. On 25 January 1943, Sophie Scholl, who arranges for the group to have the necessary materials, addresses, who organizes its finances and helps produce the leaflets, hands him a parcel with 2000 leaflets for him to distribute. Susanne Hirzel begins her musical studies in Stuttgart in 1941. Ever since their time together in the ‘Bund Deutscher Mädel’ (League of German Girls, BDM, the female branch of the Hitler Youth) she has been a good friend of Sophie Scholl’s. Her and her brother Hans put the fifth leaflet into mailboxes all over Stuttgart during the night of 27 January 1943. It is Franz J. Müller who provides the money, envelopes and stamps for the leaflets. He and Hans Hirzel envelop and stamp the 2000 copies, hiding behind the organ in the Martin-Luther-Church in Ulm. Müller then goes on to bring some of the leaflets to acquaintances of his in Heilbronn. Heinrich Guter is a classmate of Hans Hirzel’s and Franz J. Müller’s. He knows about the leaflets, does not participate in their dissemination, but does not denounce his friends to the Gestapo. Eugen Grimminger loses his position as auditor in 1935 due to racist provisions condemning his marriage with Jenny Stern, who is Jewish, and his opposition to the NS regime. He starts working as a self-employed tax consultant in Stuttgart. When Robert Scholl, Hans’ and Sophie’s father, is condemned to four months’ imprisonment in 1942 for a critical remark he had made about Hitler, his friend Grimminger takes over Scholl’s tax office without thinking twice. Hans Scholl and Alexander Schmorell visit him in Stuttgart in late 1942 and initiate him into their resistance activities and plans. He supports them with a large amount of money which they use to buy a more sophisticated duplication machine. Eugen Grimminger’s wife Jenny Stern is considered Jewish according to the racist Nuremberg laws. Before the war, Grimminger helps Jewish family and friends flee to other countries. He is apprehended on 02 March 1943. His wife is murdered in Auschwitz on 02 December 1943. Willi Graf takes several trips to his hometown Saarbrücken as well as to Bonn, Freiburg, Cologne and Ulm in late 1942/early 1943. He wants to gain the support of his old friends from the Catholic youth movement. Only three of them, the brothers Wilhelm and Heinrich Bollinger and Helmut Bauer, accept to distribute the leaflets. Chemistry student Wilhelm Bollinger works as a medical orderly in a military hospital in Saarbrücken. He procures a gun there and forges military leave forms and transportation tickets for Willi Graf and his friends. Wilhelm Bollinger receives the fifth leaflet from Willi Graf on 22 January 1943. Graf probably gives him a duplication machine as well. Bollinger sends out around 200 leaflets to academics in Saarbrücken. Heinrich Bollinger and Helmut Bauer are in favor of the leaflets and resistance activities but do not take action themselves. When Willi Graf hands the fifth leaflet to Heinrich Bollinger on 24 January 1943, Bollinger comments that “Many more bombs need to drop for this stupid people to understand anything”. Medical student Traute Lafrenz transfers from Hamburg to Munich University in 1941. She makes friends with Hans Scholl there. The two discuss literature and Bible texts such as the Proverbs of Solomon. When she receives one of the White Rose leaflets in the summer of 1942, she recognizes Hans Scholl as the author behind the leaflet. Traute Lafrenz takes White Rose leaflets to Hamburg (and Vienna). It is she also who informs the parents after the arrest of Hans and Sophie Scholl. After their sentencing, she submits of clemency plea by the Scholl and Probst families. On 24 February, she learns that her friends have already been executed and accompanies the Scholl family to the burial. Lieselotte Ramdohr, a friend of Hans Scholl’s and Alexander Schmorell’s, tells them about a resistance group in Berlin called “Rote Kapelle” (‘Red Orchestra’ – this name was given to the loosely connected group by the Gestapo). Scholl and Schmorell want to establish contacts with this group and meet with Falk Harnack for that purpose several times in the winter of 1942/43. Falk’s brother Arvid Harnack was at the top of the ‘Red Orchestra’, a group uncovered by the Gestapo as of August 1942. Their first meeting with Falk Harnack takes place in Chemnitz in November 1942, later talks in Munich in February 1943 are joined by Willi Graf and Kurt Huber. The dramaturge Falk Harnack opens up the perspective of possible connections to regime critics like Dietrich Bonhoeffer in Berlin for Scholl and Schmorell. They set up a meeting in the capital for 25 February 1943 which can no longer take place. Hans Scholl has already been executed by then. Another Berlin resistance group around journalist Ruth Andreas-Friedrich and conductor Leo Borchard hides deserters, dissidents, and Jewish friends. The group provides food, medication, and forged papers for them. The network remains undetected until the end of the war, using the codeword “Onkel Emil”, “uncle Emil”. They receive the sixth White Rose leaflet in March 1943 and copy and distribute it by the hundreds. Medical student Albert Suhr belongs to an oppositional circle around Heinz Kucharski and Karl Ludwig Schneider in Hamburg. In the spring of 1943, Suhr copies and disseminates the third White Rose leaflet. He is arrested in September 1943 and freed from Stendal prison on 12 April 1945. Copyright © 2017 Weiße Rose Stiftung e.V.